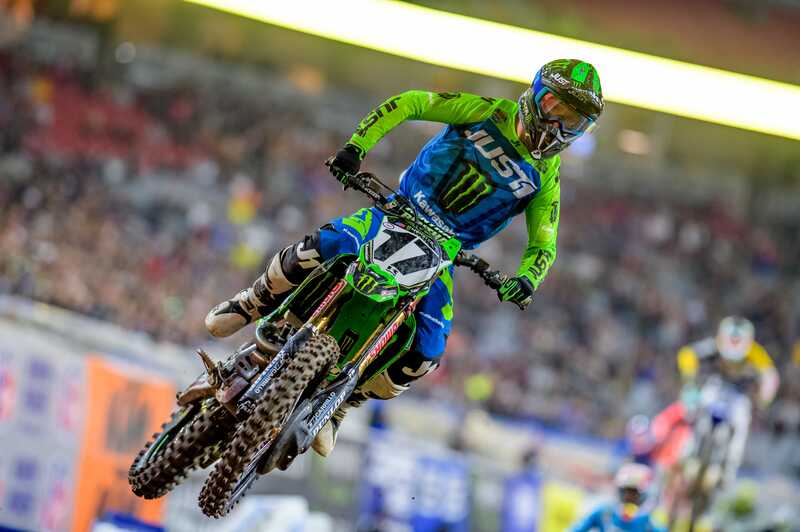 After an unusually damp opening round in Anaheim, the 2019 Monster Energy® AMA Supercross, an FIM World Championship resumed for action in the covered State Farm Stadium of Glendale, Arizona. Monster Energy/Pro Circuit/Kawasaki rider Adam Cianciarulo, dominated the day by taking his 250SX Heat race from holeshot to checkered flag and would replicate that performance in the 250SX Main Event to capture his first victory of the season. 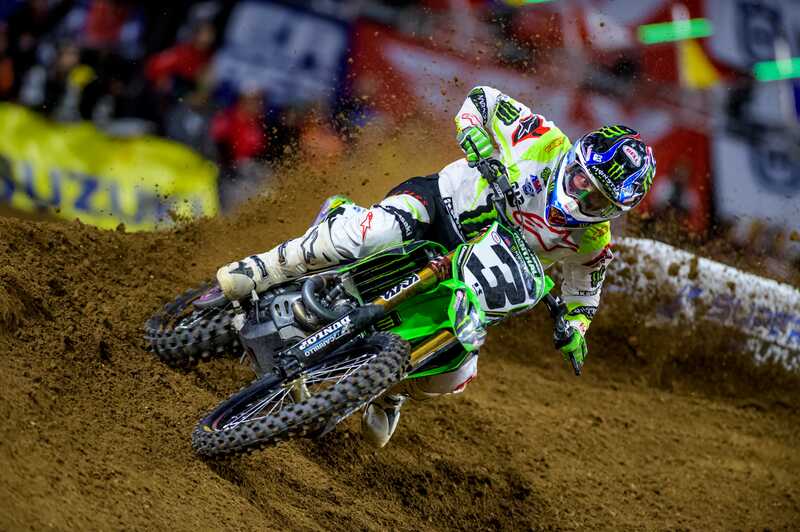 Monster Energy Kawasaki rider Eli Tomac, finished the night in fourth, holding his third-place position in the 450SX Point Standings and gaining a valuable point on the series leader. As the gate dropped on the 450SX Heat 2, Tomac was clipped from behind in the first rhythm section forcing him slow down and inspect for damages to his KX™ before continuing the race. Tomac managed to pass seven of his competitors before running out of time, finishing 10th and forced to compete in the Last Chance Qualifiers race, where he would finish first and advance to the Main Event. After qualifying eighth on the day, Joey Savatgy's night came to a sudden end after crashing in the 450SX Heat 1 race. Savatgy's small mistake caused him to sit out the rest of the night due to the strict concussion protocol being enforced for the 2019 season. 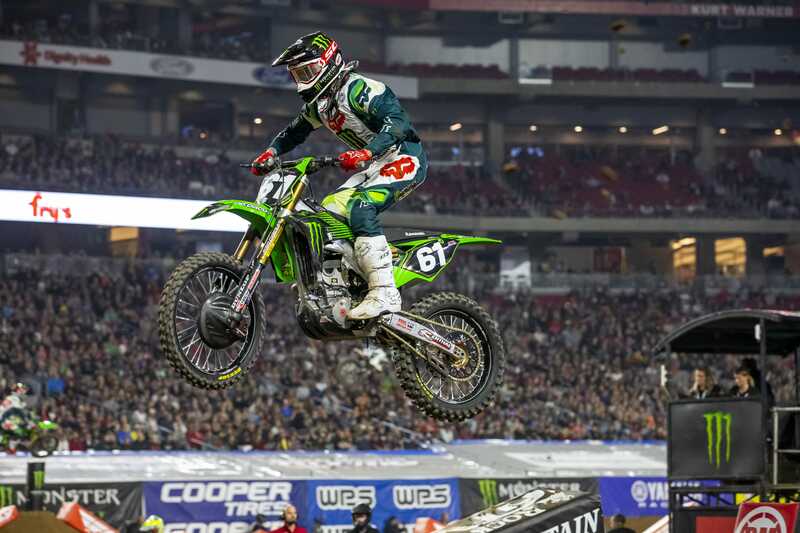 The Monster Energy/Pro Circuit/Kawasaki team impressed once again for Round 2 of the 2019 Monster Energy Supercross series with Cianciarulo riding flawlessly all night and his rookie teammate Garrett Marchbanks capturing another top-10 overall finish. Cianciarulo delivered Kawasaki their first main event win of the season as he grabbed the holeshot in the 250SX Main Event and never looked back. He now sits second, just five points behind the leader in the 250SX West Championship Points Standing. The No. 61 of Marchbanks showed no signs of slowing down as he finished eighth in the 250SX Heat 2 race. As Marchbanks shot out of the gate in the 250SX Main Event, the rookie showed his strength and determination by climbing from 17th place all the way to finish ninth, continuing to show improvement each time he's on the track. Round 15 of Monster Energy® AMA Supercross, an FIM World Championship returned to the mile high city of Denver for the first time since 1996. 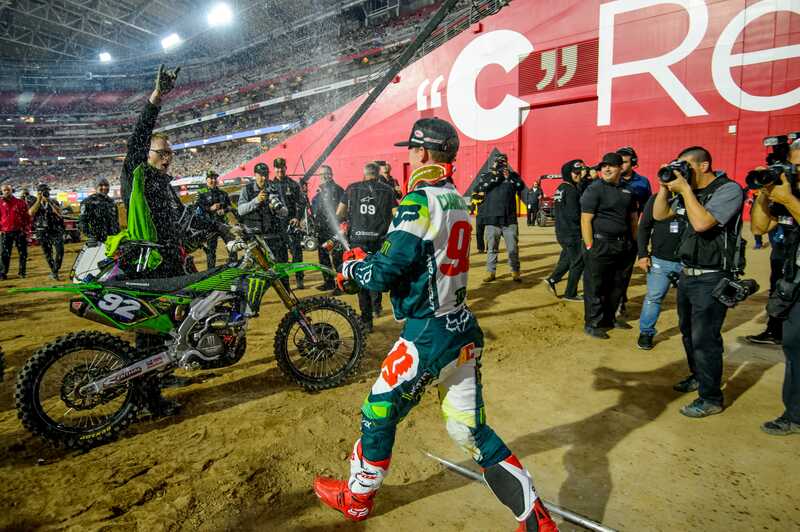 Home-state hero, Monster Energy® Kawasaki rider Eli Tomac and Monster Energy/Pro Circuit/Kawasaki's Adam Cianciarulo both captured victories at Broncos Stadium at Mile High in their respective classes, each earning their fifth win of the 2019 season. Foothill Ranch, Calif. (April 7, 2019) – Round 14 of Monster Energy® AMA Supercross, an FIM World Championship hosted its inaugural race in Nashville, Tennessee at Nissan Stadium. 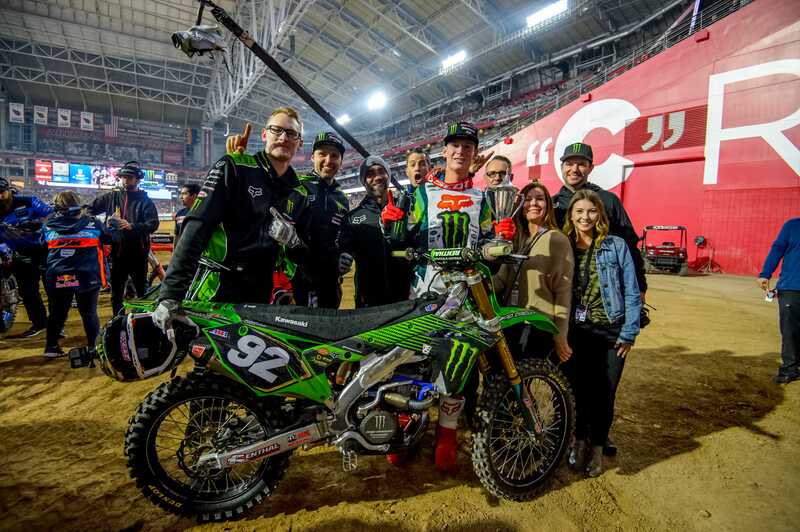 Monster Energy® Kawasaki rider Eli Tomac and Monster Energy/Pro Circuit/Kawasaki's Martin Davalos both captured wins in their respective classes earning Kawasaki a clean sweep on the night. Round 13 of Monster Energy® AMA Supercross, an FIM World Championship hosted the final Triple Crown event of the season at NRG Stadium in Houston, Texas as Monster Energy® Kawasaki rider Eli Tomac and Monster Energy/Pro Circuit/Kawasaki's Adam Cianciarulo both captured fourth-place overall finishes in their respective classes. Round 12 of Monster Energy® AMA Supercross, an FIM World Championship featured a slick race track and clear skies over CenturyLink Field as Kawasaki landed on the podium in both classes with Eli Tomac capturing third in the 450SX class, while Adam Cianciarulo grabbed second in the 250SX class. Lucas Oil Stadium in Indianapolis, Indiana played host to Round 11 of the Monster Energy® AMA Supercross, an FIM World Championship that featured another dominant performance from Monster Energy/Pro Circuit/Kawasaki rider Austin Forkner who was able to capture his fifth win of the season and extend his championship points lead to 26 points with his teammate Martin Davalos finishing fifth. In the 450SX class, both Monster Energy Kawasaki riders of Eli Tomac and Joey Savatgy were able to string together consistent results with fourth and sixth place finishes respectively.